Isopogon are a group of small to medium shrubs, commonly called ‘Candy Cones’ ‘Drumsticks’ and ‘Little drumsticks’ depending on the species. Looking like a miniature Protea, Isopogan are related, and with over 30 species a number of garden worthy varieties are readily available. Isopogon can be found from New South Wales (Isopogon anemonifolius) to Western Australia (Isopogon formosus). The species from Western Australia are generally the more spectacular flowering of the species and as such make wonderful garden specimens. However, as with many plants from Western Australia they do seem better suited as a garden plant when grafted onto rootstock from the eastern species. 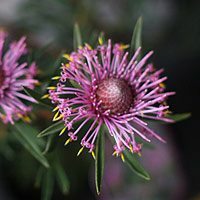 Flowers range from rosy pink to yellow and the sizes vary from around 1m in height to .5m.The lower growing Isopogon varieties making great ground cover plants. All species flower from winter to spring, lagging colour and interest when it is most needed. Originally known as‘Coneflowers’, however names change as plants become cultivated. They grow well in coastal conditions, and are excellent in a well drained garden bed or container. All varieties attract birds, bees and butterflies to the garden. All are low maintenance easy care plants in the right conditions. Isopogons generally prefer a well drained soil and a Mediterranean style climate with dry summers, sun to part shade. Frost free environment – Although some species will tolerate very light frosts. Good air circulation is important as these are a genus that do not like humid conditions. Tip prune from an early age for best results. Plants should not be hard pruned, or printed back into old wood as they usually fail to regenerate. Use them as a filler in the border, with the lower growing varieties looking great at the front of the border. Grow them planted en masse as a ground cover plant, or grow the smaller varieties in containers.